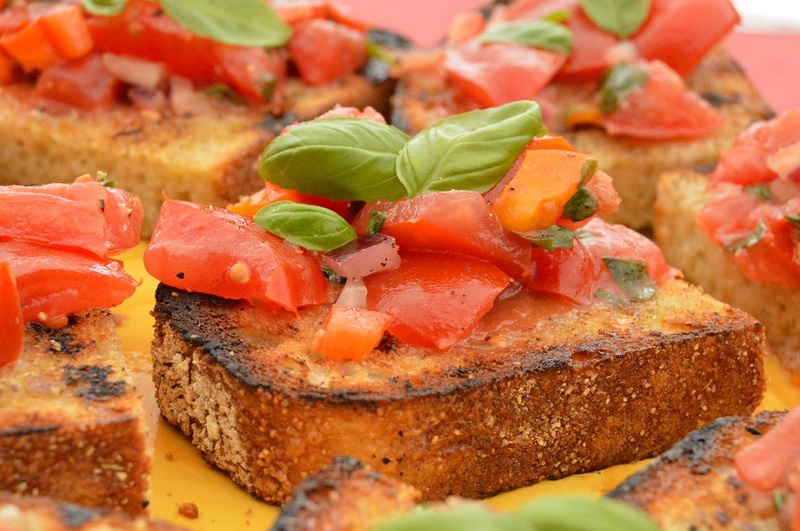 Bruschetta is one of those things that cannot fail to put a smile on my face when I eat it. Perfect as a starter, served with barbeque food or just as a light bite at any time of the day, one slice is never enough. 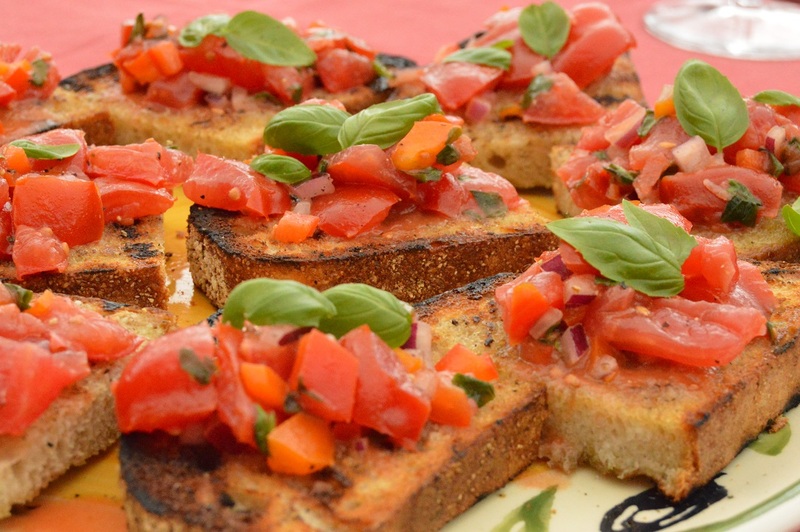 Bruschetta is a very quick and easy to make: as indeed it ought to be; poshing it up and the like is not allowed! The total simplicity of the ingredients results in the most intense fresh flavour. Normally I use tomatoes straight from the greenhouse; the flavours you get are incomparable, but as this year’s tomatoes are nowhere near ready for picking, I bought some for this. Well, needs must: despite my love of home-grown produce, I am more than happy to buy good quality produce if it means I get to eat good food! Either way, go for the best quality tomatoes you can find, but keep them at room temperature or, even better, slightly warm by leaving them on a window sill or in the greenhouse, which really makes the flavour sing. I have even been known to warm a few in the oven first which does the same trick! I think sourdough bread makes the best bruschetta. I used some of a sourdough loaf I had made earlier, which had a touch of both rye flour and wholemeal flour in the dough. Ciabatta, sliced lengthways, would be my second choice but any good quality bread will do. I prefer to pop the bread on a barbeque for a few minutes on either side to get a lovely smoky flavour, cooking until you get those lovely ridges showing. A bit of charring here and there is, I think, quite important with bruschetta. A solid griddle pan works excellently too. In addition to the tomatoes, I like to use just a little chopped pepper and red onion for the texture and the flavour they bring, but occasionally just tomato and fresh basil is all I need. I do think garlic is essential, though: not much at all, just enough to give a hint of it as you bite into the crisp bread. I sometimes like to add chopped anchovies (the salty ones in tins are heavenly), a little dried ham or small pieces of cheese (a salty cheese is particuarly fantastic). However, the challenge is exercising a little restraint so as not to over-do it! (1) Mix the filling ingredients together in a bowl, adding enough vinegar to give a subtle sharpness. Set aside until needed: the longer you leave it, the more the flavours develop. You will also get more juices if you leave it longer but this is no bad thing: I love spooning some of this wonderful flavoured juice over the bread before topping. (2) Place the sourdough on a hot griddle or barbeque and cook for a few minutes, turning over from time to time, until both sides are very crisp: some charring here and there is to be applauded! Alternatively, pop them under a grill until crisp. (3) Rub the garlic over one side of each piece of bread and brush or drizzle the bread with extra-virgin olive oil. A liberal application is key here! (4) Cut each piece in half and spoon the filling over the top of each. You can also scatter over whole basil leaves and a generous grinding of black pepper before tucking in, but don’t leave the bruschetta lying around too long as you want to retain a lot of the crispness. Simple yet complex – looks extremely tasty!